This outpatient surgery, oncology treatment and medical office facility asserts that a more-natural and less-clinical environment promotes healing in patients and productive behavior in medical staff. The architects sought the maximum inclusion of natural lighting and ventilation, and an enhanced indoor-outdoor connection. The design concept is inspired by the belief that principles of Modernism are the ideal means to realize the high standards of sustainability in healthcare design. The design achieves an aesthetic ideal, while delivering a patient-focused healing environment, the utility required by the owner, and the requirements for Gold LEED certification. This is the only project to win AIA-AAH Awards in both on-the-boards and built categories. Peace Island Medical Center began with a remote island community uniting to realize their vision of rural healthcare in the San Juan Islands. The hospital melds discreetly into the old-growth forest, basalt slopes and wetlands. Island resources are extremely limited, making sustainable choices fundamental. Naturally ventilated clinical areas and patient rooms connect occupants with fresh air and drive down energy use. The design reflects the values of the caregivers and community, embodying humility, environmental sensitivity and innovation. The Living Building Challenge served as a roadmap for sustainable initiatives, decoupled mechanical systems, greatly reduced potable water use and minimal energy use. The 34,000-square-foot building houses a primary care clinic, a behavioral health clinic, childcare facilities, a dental clinic and a workforce community center. The co-location of these functions led the design team to consider the communal folk art of quilting and inspiration also came from the constructed paintings of contemporary Atlanta artist Radcliffe Bailey, who pieces together found objects, archival photographs and historic imagery with jazz-like effects. The design-build, fast-track project was completed, from start to finish, in 275 days. It required coordinating the participation of multiple stakeholders including the City of Atlanta and Fulton County governments, the contracting firm Whiting-Turner, Fulton County Board of Commissioners Vice Chair Emma Darnell, the Fulton County Office of Cultural Affairs, the staff of West End Medical Center and residents of the Adamsville neighborhood. The new Smokey Point Medical Center houses twenty different medical specialties in a two-story 60,000-square-foot clinic designed to reflect The Everett Clinic’s values and to streamline and enhance the patient experience by reducing wait times and providing comprehensive care in a single easy to access community location. The facility was designed using Lean with a focus on achieving a highly efficient, flexible and patient-focused care environment that expressed affordable elegance. This facility manifests the Everett Clinic’s core values: do what is right for each patient; provide and enriching and supportive care environment; and deliver value in quality, cost and service. The University of Minnesota Amplatz Children’s Hospital started with a vision: to create the ideal environment in which to provide and receive children’s healthcare. Today, the hospital is setting new standards for safety, comfort, and clinical efficiency. The six-story building consolidates the pediatric programs and inpatient units. It includes 96 same-handed, private inpatient rooms, a sedation/observation unit, dialysis unit, pediatric emergency department, an expansion of the existing imaging department and surgical suite, family resource center, gift shop, and underground parking. The building creates a distinctive identity for the hospital, immediately engaging visitors with its bright and playful exterior of multi-colored stainless steel panels. An interactive interior design theme, “Passport to Discovery,” enlivens the interior, aids in wayfinding, and offers opportunities for diversion and discovery. Nationally recognized for its innovative approach to sustainable design, healing environments and technical execution, Palomar Medical Center is the first phase of development of a new 35-acre campus that includes the 360-bed acute-care hospital and a new central plant. Innovations in medical planning and architectural design meet the project goals of improving access to care, improving operational efficiencies, and creating sustainable, high-performance healing environments. 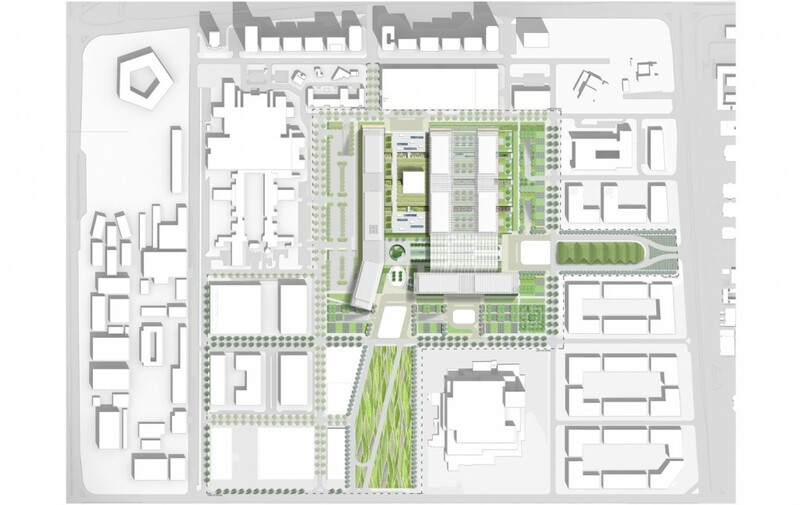 Design strategies incorporate garden spaces at every level of the 11-story nursing tower, and utilize green-roof technology that extends the landscape and improves views from the patient rooms. The design includes a full complement of water conservation, air quality, and energy-saving measures. San Antonio Military Medical Center an addition to the Brooke Army Medical Center; Fort Sam Houston, Texas – RTKL Associates, Inc. The San Antonio Military Medical Center (SAMMC) is the largest inpatient medical center for the U.S. Department of Defense and the agency’s only American Burn Associated-verified burn center. The building, which opened in 2011, adds 102 beds, a rehabilitation clinic, expanded operating room capabilities, a new emergency department and a new patient bed tower. It also includes a parking structure for 5,000 vehicles, and ancillary support and infrastructure. RTKL was commissioned to design the new 760,000 -square-foot, LEED Silver certified building after working on a number of other projects for the U.S. Army Corps of Engineers in support of their 2005 Base Realignment and Closure (BRAC) initiative. In the groundbreaking clinical research facility, Brigham and Women’s Hospital’s AMIGO Suite, an operating room is linked to adjacent imaging suites, enabling the patient to remain static while the machines—including a 33,000-pound MRI—move from one chamber to another in the midst of a surgical procedure. The array of infrastructure necessary to enable this technology was deftly concealed behind walls and above ceilings, which were kept neutral in appearance so as not to compete with critical patient information displays. The kinetic qualities of the suite are captured on the floor, where the arc of the operating table’s rotation and the limits of the magnet’s Gaussian surfaces are vividly rendered in a palette of colors derived from the facility’s cutting-edge equipment. The project was to reduce the number of beds, staff and patient waiting times in a major teaching hospital emergency department while at the same time, increase patient safety and comfort. This study concluded that 60% of emergency department patients did not need to be in a bed, but could be seen in a less intense setting. Building less beds, needs less staff and requires a new physical layout to accommodate the new patient flow. That gave rise to new possibilities of enhanced patient spaces with amenities resembling that of airline first class accommodations. Computer simulations were liberally used to establish the size and staffing required for the new patient flow model. That was further buttressed by physical trials using actual patients. The spirit of collaboration was the driving force uniting Kaleida Health and the University at Buffalo within a single structure, and the building strives to bring several disciplines and its patients, surgeons and researchers, together to exchange knowledge and ignite innovation. The 476,000-square-foot facility achieves this by stacking a translational research building over a clinical vascular institute. The first four floors of this 10-story “vertical campus,” house the Gates Vascular Institute, with the Clinical Translational Research Center occupying the top half of the building. Sandwiched between the two, is a two-level “collaborative core”—the binder that connects doctors and researchers from varying specialties to meet in a variety of dynamic situations to accelerate medical discoveries—moving science from the bench to the bedside. 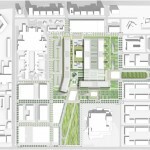 Category E: Master Planning Urban Design for Healthcare Settings Focal Point Community Campus; Chicago – HDR Architecture, Inc. Located in Southwest Chicago, it is one of the most vibrant, yet blighted, neighborhoods in the city. 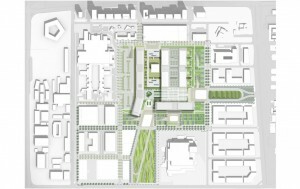 Acting as both an anchor and a change agent, the hospital is envisioned as an urban campus that fosters a relationship between the hospital and its community. The two are intrinsically linked by a “circulatory system” – a band of food and retail markets, fitness centers, etc. that runs along the third floor of the building. This system serves as the interface between the world of healthcare and the world beyond, and it literally brings the two together – a new paradigm in the industry. Furthermore, the building treads lightly on the site. Its ground floor is wrapped with glass and its grounds are replete with wellness gardens, soccer fields, and basketball courts.